Hasbro released 16 puzzles from 1982-1988. ​Visit the Puzzles Overview page to see them all, and don't forget to scroll down for the ExtraZoom galleries where you can zoom in on all of the details! Hasbro teamed up with Colorforms in 1985 to release "Cobra's Revenge.” This “Listen ’n Play" book included a yellow cassette that you played back while playing with the included Colorforms! Head on over to the “Cobra’s Revenge” page to hear the audio and check out the fully painted art! Next, Hasbro teamed up with Kid Stuff Records & Tapes once again in 1986 to release "Cobra Strikes!” and "Destro’s Doomsday Auction." Both books included an audio cassette that you played back while reading the book – so you could SEE the pictures, HEAR the story, and READ the book! Head on over to the "Cobra Strikes!” and "Destro’s Doomsday Auction” pages to check out the dynamic comic-book style art by Pablo and Judith Marcos. 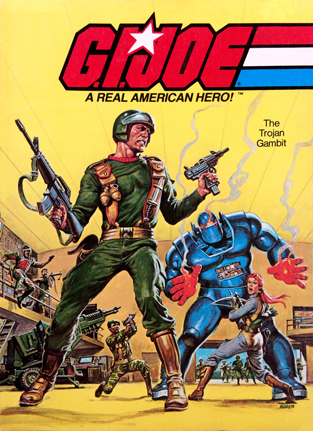 The packaging of G.I.Joe: A Real American Hero was incredibly impactful, and every element served a purpose. This video presentation was developed by Kirk Bozigian and presented by Carson Mataxis. Learn about Kirk's role on G.I.Joe here and check out every carded figure from 1982-1994 here! The 1991 "Escape from Doom!" booklet introduced the Micro Vehicles. Eight different Micro Vehicles were available, each based on a previously released vehicle. Head on over to the Micro Vehicles page to see them all! Hasbro released two Listen 'n Look books that included two-sided cassettes and Kid Stuff Records & Tapes released three books that included two-sided records in 1984. Hit play on the audio file and click through the image galleries to enjoy these G.I. Joe classic as they were intended! 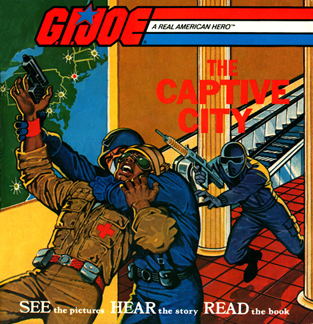 Marvel Books published several licensed G.I.Joe books in 1983. "Operation: Disappearance!," "The Spy Eye" and "The Trojan Gambit,” and "Operation Decoy" are now available on 3DJoes! 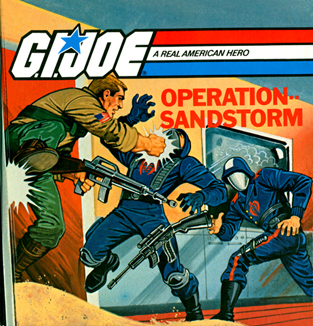 3DJoes is dedicated to preserving the art of G.I.Joe: A Real American Hero! We are in the process of adding more than a dozen beautifully illustrated books for your viewing pleasure, so keep an eye on the brand new Books Overview page for these and more. Like us on Facebook, and follow us on twitter so you won't miss an update! In 1983 Hasbro partnered with Aviva to release six die-cast metal versions of their classic 1982 vehicle lineup (the JUMP was the only one not recreated). These small, heavyweight die-cast vehicles are highly detailed and feature almost all of the play features of their predecessors. Check them out on the 1983 Die-Cast Metal Vehicles page, under the new Licensed tab in the main navigation bar! The Dreadnok Air Skiff’s delta-shaped primary lifting foil, aluminum/epoxy winglets, and directional vanes all ensure a smooth ride on this 800 hp single seater. It's a good thing, because Zanzibar drives like a maniac! 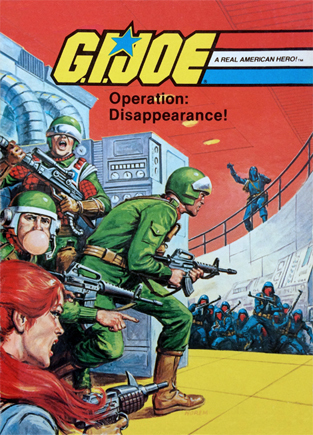 The 1982 product catalog and a black and white one-sided vehicle insert featured an offer to join the G.I.Joe Mobile Strike Force Team. Visit the 1982 G.I. Joe Mobile Strike Force Team Blockbuster Membership Kit page to see the dog tag, belt, membership card, iron-on logo, and introductory newsletter that new members received. Hardcovers, accufoil softcovers, and ebooks from iTunes and Amazon are all available. Visit the 3DJoes books page to learn more! The last three Night Force vehicles have arrived! Check out the new 1988 Night Blaster, 1988 Night Striker and 1989 Night Ray pages. A HUGE thanks to Dan Carroll for loaning his Night Blaster and Night Striker to the cause! Three variations of Starduster version 1 were released from 1987-1991. These are commonly referred to as v1a-v1c. Visit the Starduster page to learn about all three! Figures courtesy of Dan Carroll. Thanks, Dan! Five variations of Steel Brigade version 1 were released from 1987-1991. These are commonly referred to as v1a-v1e. Visit the Steel Brigade page to learn about all five! Figures courtesy of Dan Carroll. Thanks, Dan! Did you know there is a rare yellow-neck variation of Serpentor? Visit the Serpentor page to check it out! Figure courtesy of Dan Carroll. The Electric Train and Battle Set features dozens of vehicles, figures and accessories. The primary attraction is a 5 unit electric train set. Cobra and G.I.Joe each come equipped 26 troops, two tanks and a jeep. The Joes also have a helicopter and a boat, while Cobra has a bridge. The set documented on this page was a MIB sample, so we documented the unboxing for the community to see. This is the most heavily documented item on 3DJoes to date, we hope you enjoy it! Collecting the Art of G.I. 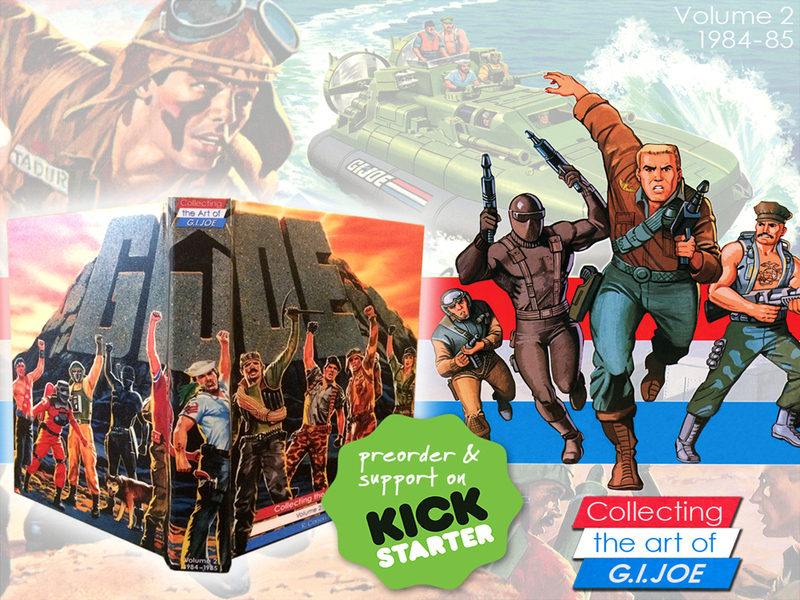 Joe: Volume 1 is a 60 page 8"x11" celebration of the painted art of G.I.Joe: A Real American Hero. It covers the first two years of figures, vehicles, playsets and peripheral painted art. The campaign ends ends on June 8th. Please make a pledge today! Vimeo is now selling the entire G.I. Joe: A Real American Hero animated series! All 95 episodes are available for $1.99 each or $40 for the entire series. You can stream your purchases anytime on your computer, TV, mobile, or tablet (with an internet connection of course). Want to take your purchases with you? Download Vimeo's DRM-free SD, HD, and mobile files! Vimeo has much better video compression than YouTube. I've been using them for years to host my own professional video samples, so I'm glad to see G.I. Joe and Vimeo have teamed up. Even more exciting, Vimeo has offered a 10% referral bonus to help keep 3DJoes spinning ad free. Please, buy yours today! All four Battlefield Robots were designed by Guy Cassaday. He optimized costs by utilizing the maroon gun, missiles, and whip antenna on both Cobra Battlefield Robots and the gray wheels, green whip antenna, missiles and missile rack on both G.I.Joe Battlefield Robots. You can see them all on the 1989 vehicle overview, or click these names to go straight to each one: Cobra Devastator, Cobra Hovercraft, Radar Rat, Tri-Blaster. The Night Shade is a remake of the 1984 S.H.A.R.C. and the Night Storm is a remake of the 1987 Persuader. A big thanks to Dan Carroll for loaning 3DJoes these wonderful vehicles. Check out his eBay store for tons of vintage Joes! Head on over to the Books page under Store to find out more! I picked up both "To the Rescue" and "Stars and Stripes Forever" posters with the original mailing tube at JoeCon! It was my priciest acquisition of the show, but worth every penny! "Stars and Stripes Forever" was painted by Ron Rudat, and "To the Rescue" was commissioned by Aladdin Thermos for their tin lunch box. Find out more about these beautiful posters and marvel at the close up image galleries over on the 1982 mail order posters page! Be sure to check out all of the other art under the print tab! Ballantine Books published 20 “Find Your Fate” G.I. Joe books from 1985-1987. These books were a ton of fun because, unlike anything else I read as a kid, I was allowed to guide the story. At various turning points throughout the book you were presented with options. You then picked a path and thus decided the outcome of the story. This might not seem like such a novel concept among today’s free roaming video games and interactive learning modules, but it really stood out in the mid-80s as an entirely new way to consume stories. The books featured beautiful covers illustrated by Carl Cassler (covers 1-4) and Hector Garrido (covers 5-20). Head on over to the Find Your Fate page to check out all 20 covers! Every image on this page was scanned, photoshopped and contributed by Greg and Page Wagner. If you love to talk Joes, give Page a shout on twitter, and be sure to check out their eBay store for tons of vintage Joes! 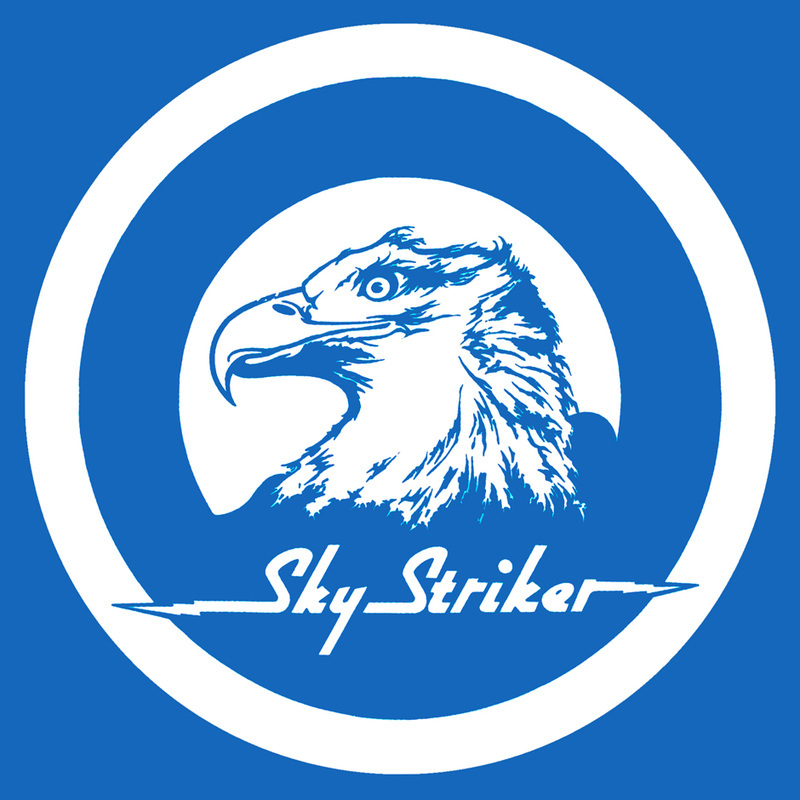 Ron Rudat designed the artwork for the Skystriker. We recently digitally restored the tail fin and parachute illustrations with the help of Mr. Rudat. 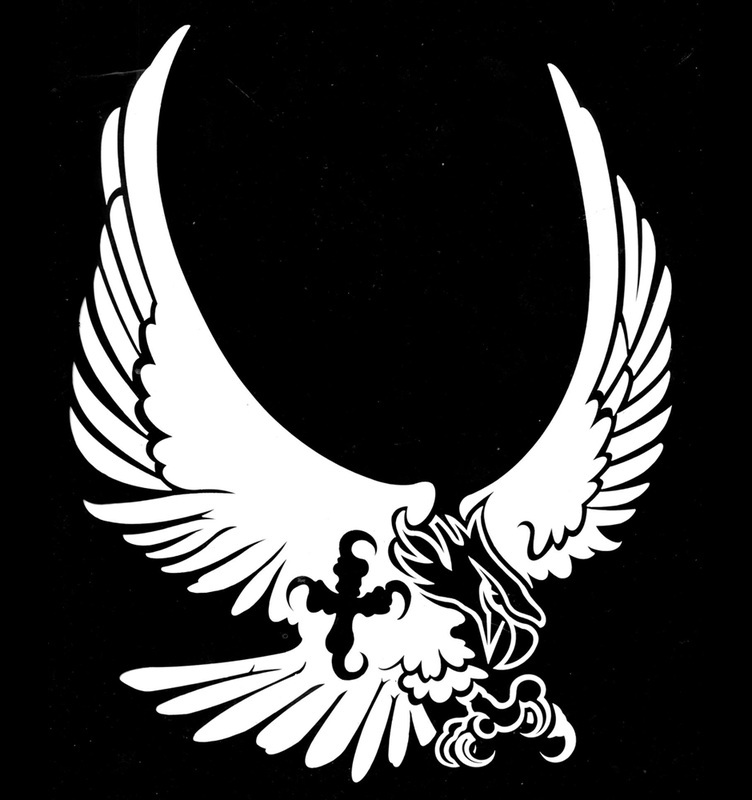 Head on over to the Skystriker page to check out these classic logos! I'm excited to welcome 3DSuperJoes.com to the 3DJoes family! Give em a "like" on Facebook, and of course go check out the web site! The Night Force Night Boomer is a rare, highly sought after re-release of the 1983 Skystriker. The Crusader is an interesting mash-up of the Defiant's Space Craft and the Night Raven S³P's reconnaissance jet. The Cobra Condor Z25 is an all original Cobra bomber that splits to become two aircraft. The books featured beautiful covers illustrated by Carl Cassler (covers 1-4) and Hector Garrido (covers 5-20). Head on over to the Find Your Fate page to check out the first 15 covers! The G.I. Joe Rolodex now features every ARAH file card, from 1982-1994 on one mobile friendly page. Thank you to all of the folks that contributed missing file cards over the last couple years! Find a missing file card? Please let me know! Chad, AKA Flophouse Films on YouTube, has documented two of the most amazing G.I. Joe collections ever seen. Check out Airedevon's collection and Mark Bellomo's collection in 36 videos! 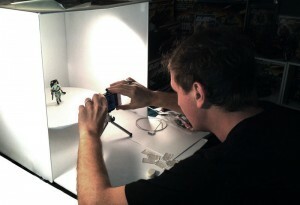 Chad is also building an incredible online display case of his own impressive collection, called GiJOE GaLLERY. Check it out! 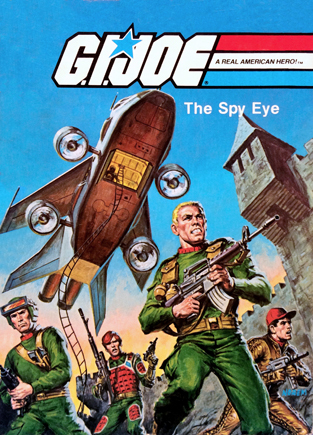 Ron Rudat was the figure designer behind G.I. Joe: A Real American Hero. From the rebirth of G.I. Joe in 1982 until he moved off of the brand in 1986, every figure sprung from his mind onto the page. He also designed several vehicles, vehicle decals, books, and the timeless Cobra logo. Ron will be inducted into the Toy Collectors Hall of Fame in Las Vegas Nevada on February 28th. Ron is the first G.I. Joe inductee. I think they made an excellent selection. Head on over to Ron Rudat's page and get to know this hall-of-famer! The 1987 Cobra WOLF (Winter Operational Light Fighting Vehicle) is actually quite well armed: featuring four surface-to-air missiles, two ski torpedoes and "Ripper" 20 mm cannons. Plus it can carry up to eight troops into battle! Kirk Bozigian was arguably the most influential contributor to G.I. Joe: A Real American Hero. He worked on the brand since before the big launch in 1982 and served on and off through 1994, the last year A Real American Hero was on shelves. Head on over to Kirk Bozigian's page for a look at the very first Creator Profile! Creator profiles for Ron Rudat and Guy Cassaday are currently in development and should be available soon. Over the course of the next few years I hope to interview any additional willing participants that worked on our favorite brand during the A Real American Hero era. If you worked on G.I. Joe from 1982-1994 and want to participate in the 3DJoes oral history project, please contact me through Facebook or Twitter and we will make it happen! From these interviews I will create in depth "Creator Profiles" with extensive audio interviews. I will also add "Creator Commentary" to each figure or vehicle page that they comment on. In addition to showcasing these interviews, the Creator Profiles will consolidate old magazine articles, TV interviews and additional media from around the web. Finally, I will gladly promote other fans' efforts to acknowledge the creators behind our favorite brand and link to their content (with their permission). If you have creator focused content and would like for me to include it here, then please contact me through Facebook or Twitter. I would love to team up to make this resource as comprehensive as it can be! Every year Sears put out a massive catalog, known as the Sears Wish Book. They showed off the years' latest and greatest G.I. Joes. 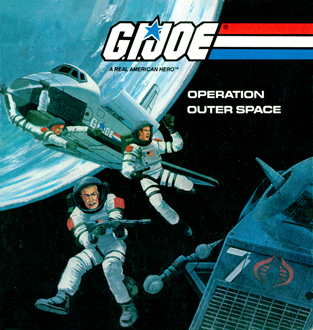 They were interesting for a few reasons: they usually set up the figures and vehicles on some cool dioramas, they featured many pre-production vehicles, and they usually featured exclusive Joe products, sold only at Sears. The 1982 catalog showed off all of the Joe vehicles but the HAL, and introduced the 1982 exclusive, the "Cobra Command Headquarters." See this and the rest on the Sears Wish Books page! The Cobra Mamba is a supersonic twin-rotor attack helicopter loaded with eight missiles, three bombs and two detachable attack pods. Be sure to check out the detailed image gallery below the box art to see all of the Mamba's play features. The Mean Dog is three vehicles in one: a V-8, 440 BHP armed recon vehicle, a mobile missile arsenal with 12 SAM missiles, and a giant standalone cannon. Be sure to check out the detailed image gallery below the box art to see all of the play features. There is a new tab in town! Look under Print > Other and you will find various pieces of 1980s G.I. Joe merchandise that sport beautiful illustrations. As I add more to my collection I will add them here. My goal with this section is to collect and document all of the high quality illustrations of the 80s. For now, check out the 1982 lunchbox, 1987 dinner tray, and 1987 puzzle! Cobra's love affair with VTOL planes started in 1984 with the Cobra Rattler. That tradition carried on into 1989 with the second generation Cobra FANG. The Cobra Devestator has also arrived. Dozens of new catalogs and offers have been added to the 3DJoes print section! I have now documented almost every single catalog and offer from 1982-1994, thanks to a huge loan from Tim Dz. Some of these have never before been documented! Additionally, I revised all of the large pieces adding image galleries that allow you to read every bit of copy and marvel at all of the illustration and photography. Head on over to the catalogs and offers page and get ready for hours of nostalgia! Look under Video > Fan Films in the navigation bar above to see a bunch of awesome videos made by Joe fans for Joe fans. Also, be sure to check out the 1986 Catalogs and Offers page, now with new offers and close up galleries for every offer! I've just returned from the G.I. Joe trip of a lifetime. Read more about it here. The 1982-85 catalogs and offers pages just got a major overhaul. They now features several new offers, courtesy of Tim Dz. Thanks, Tim! I’ve also added close ups of every catalog and offer, like this one, so you can get a good look at all of the art and copy. Enjoy! The Cobra Night Raven is all about one thing, speed! It is capable of flight at 3 times the speed of sound (Mach 3.5 to be precise). The Conquest X-30's advanced forward-swept wing design enables precise maneuverability. Who will win? My bet is the X-30 if the Night Raven is dumb enough to slow down for a dog fight. These are the last two 1986 vehicles, so 1986 is finally complete! Be sure to check out the detailed image galleries on both pages. We'll begin with the Palisades Baroness bust! Come back every night for a new statue, including these Palisades busts: Cobra Commander, Firefly, Flint, Roadblock, Snake Eyes and finally the Diamond Snake Eyes Icons bust. All seven of these statues are from the collection of Justin Marcoux. Give him a shout over on twitter, he loves to talk Joes! The Sideshow Collectibles Flint VS Zartan statue has arrived and it is incredible. I utilized some video editing tricks, combining the normal statue with the camouflage exclusive statue, so that Zartan transforms in front of your very eyes! What are you waiting for?! Go check it out on the Flint VS Zartan page. Back in 1987, Hasbro partnered with Nikko to manufacture one item I had wanted since the VAMP was released in 1982: a remote controlled vehicle! Sure the MOBAT was fun, but you couldn't steer it from afar. Enter: the Crossfire! Hasbro made two versions of the Crossfire (Alpha 27 and Delta 49) that utilize unique radio frequencies so they can race each other. Unfortunately, a rival Cobra R/C car was never introduced. Thanks to the Yo Joe Outlet, ROMA Collectibles and Tim Dz for contributing to this page! I have just added detailed image galleries to these 1984 vehicles: Cobra A.S.P., Cobra Night Stinger, Cobra C.L.A.W., Cobra Water Moccasin, S.H.A.R.C., Slugger, VAMP Mk II, VAMP & HAL and these playsets: Bivouac, Mountain Howitzer, Watch Tower. Enjoy! The books featured beautiful covers illustrated by Carl Cassler (covers 1-4) and Hector Garrido (covers 5-20). Head on over to the Find Your Fate page to check out the first six covers! While the three new Python Patrol vehicles (ASP, Conquest and STUN) and the two final Tiger Force vehicles (Tiger Fish and Tiger Sting) were repaints of previous releases, the three new Slaughter’s Marauders tanks (Armadillo, Equalizer and Lynx) were mash-ups, utilizing new parts and parts from previous vehicles. Check them all out on the 1989 Vehicle Overview, and be sure to have a look at the new detailed image galleries, calling out play features, removable parts and mold details! The Transportable Tactical Battle Platform can be flown into hot-spots by four Dragonflies, to defend land or sea from the evils of Cobra! It holds tons of figures and small vehicles and has enough play features to keep you entertained for hours. Be sure to check out the detailed image gallery! The Cobra Moray (AKA Hydrofoil) roars into sight with its V12 engine at full boar! It is loaded for bear with four Eels manning the 30 cal rear mounted machine guns and Firefly on the 23MM twin-barrel cannon. Lampreys has a bevy of weapons to lay waste to the Joes, including a 19MM remote pilot-operated machine gun, 55MM port and starboard cannons, twin surface swimming "Black-Ray" torpedoes, four 75 pound depth charges, two air-to-ground missiles and four "Jumpstart" air-to-water missiles. Check it out and learn all about hydrofoil technology over on the Cobra Moray page! The Cobra Rattler is an imposing sight! It features twin turbofan engines, 6 bombs, 8 missiles, twin rear 40mm cannons and a "Jawbreaker" nose cannon. Wild Bill never enjoyed having one of these bad boys in his rearview! Be sure to check out the detailed image gallery below the box art. I finally laid my hands on a Battle Corps Major Bludd with the earlier horizontal logo. 3DJoes now features pristine photos of horizontal and vertical logo cards for every Battle Corps figure that received the two-card treatment! I also secured a carded 1994 Star Brigade Roadblock with the black chest grenades (instead of silver) and have added that to the archive. In the midst of working on the third and final poster for the 3DJoes Kickstarter (Carded 3DJoes 1986-87), I stumbled on a really interesting variation of the Zarana card art! Head over to the Zarana page and have a look, and message me if you have any info on how/why the changes were made. The 1982 and 1983 vehicle and playset box art continues to be upgraded as I develop the new vehicle poster. Check out the 1982 Cobra Missile Command Headquarters, FLAK, HAL, RAM and VAMP, and the 1983 Polar Battle Bear, JUMP, Whirlwind and Wolverine pages to see the latest updates! In 1983 the Joes and Cobras took to the skies in flying foam gliders. The packaging of these fragile flyers shows off three moves. If you want to see them in action, check out the TV commercial where they perform various tricks. I don't dare throw my 30+ year old gliders! We have hit the first goal! A huge THANK YOU to all that have pledged. You can help 3DJoes print all three posters at here. The Mach 3+ stealthy behemoth know as the Phantom X-19 has arrived! It features two "little guy" air-to-air missiles, two terrain-hugging missiles with rotating stabilizing wings, and two retractable twin laser cannons. In addition to armament, it features sliding cockpit access, two sliding wing extenders, air brakes that lift to show engine details, working landing gear and engine exhaust that sweep in and out. Check out the detailed image gallery to see close ups of the sculpt and the various play features. The first, and many would argue best, G.I. Joe Jet has arrived! The 1983 Skystriker XP-14F features six missiles, two ejecting seats with working parachutes, removable access panels that show hydraulic details, working landing gear and wings that sweep in and out. Check out the detailed image gallery to see close ups of the sculpt and the various play features. The 3DJoes Kickstarter is now running, please pledge now and help me print three more posters! The 3DJoes KickStarter campaign is live and there is something for everyone! There are three new 24"x36" posters, three 4"x6" postcards, embroidered 3DJoes logo hats (black, white, or grey), and a Signature Series poster (limited to 25 copies) and signed by Larry Hama and Kirk Bozigian! Please pledge your support and together we'll make some posters! Thank you all for supporting 3DJoes. The A Real American Hero line is timeless. It spawned dozens of characters that have gone on to enjoy decades of artistic reinterpretation and recreation in action figures, comics, cartoons and movies. There have been some truly beautiful sculptures created over the years. I have not yet collected most of them, but I've decided to share what I have on 3DJoes. Roll over the Modern tab on the navigation bar at the top of 3DJoes to view statues from Sideshow Collectibles, Diamond Select Toys and Palisades Toys. Be sure to also visit the Palisades overview page to see seven of their wonderful statues on one page. Originally packed individually with carded Joes and Cobras in 1989, they were later sold as a set. Check out all 20 of these little plastic army men over on the Micro Figures page. 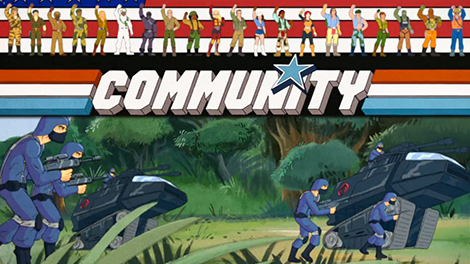 Anyone know why were the ladies of GI Joe and Cobra were excluded? The Killer W.H.A.L.E. (Warrior Hovering Assault Launching Envoy) is the grandaddy of all amphibious infantry vehicles! It is heavily armed with two 120MM "pounder" cannons, eight surface to air missiles, six (floating) depth charges and two machine gun turrets. It holds up to nine troops and features push button rear fans and a deployable recon sled and surveillance cycle! This behemoth floats on water and rolls on land. Check out the detailed image gallery to see close ups of the sculpt and play features. Sergeant Slaughter's awesome Amphibious Infantry Fighting Vehicle has arrived! The Warthog carries 9 Joes across land and sea. This rolling, floating monstrosity features 12 smoke grenade launchers, two 2-stage torpedo missiles, a 20mm shipboard machine gun, three operator stations up front and seating for six more troops in the rear. Check out the detailed image gallery to see close ups of the sculpt and play features. Finally, the baddest G.I. Joe helicopter ever has landed. This beauty carries 7 troops and features 8 missiles, 5 removable engine covers, two window guns, one winch and a rotating tilting front cannon/camera turret. Oh, and don't forget the hinged cargo door and canopy glass! This vehicle never got old. There area just too many details to capture in 360 spins, so I added 20 detailed close up photos. Let me know what you think of that new addition to the site, via Facebook or Twitter. After the success of the 1987 Motorized Action Packs, Hasbro doubled down on the concept in 1988 by releasing 11 new Action Packs and Vehicle Packs. From motorized double spinning machine guns to gyrocopters with working rotor blades, ATVs with working wheels, and scuba packs with spinning propellers - this year had it all! I remember playing with some of these as a kid and they were just flat out fun accessories that enriched playtime. Ah the good old days, when toys were all about playability! Check them out over on the 1988 vehicle overview! Destro has had enough of Cobra Commander's shenanigans! In 1988 he upgraded his silver head to gold and built an army made of Anti-Gravity Pods (A.G.P.s) and Dual Elevating Multi-Ordinance Neutralizers (D.E.M.O.N.s). He leads this new army from the seat of his Despoiler! Check them all out over on the 1988 vehicle overview. Another HUGE thank you goes out to the Yo Joe Outlet & Museum Center for loaning us these vehicles! I found a couple new 1982 and 1983 toy commercials, so check out those pages. I added a page of cartoon commercials, another with the awesome animated comic book commercials, and another still featuring other merchandise tie-in commercials. Finally, I added commercials to almost every vehicle page from 1982-1988! Just scroll to the bottom of each vehicle page to see that vehicle in action. If you find any commercials I'm missing, please contact me through Facebook or Twitter and I'll add them. If that weren’t enough, I added two more fan films: H.A.V.O.C. by Hezekiah Jones (do NOT miss this one!) and the JoeCon 2014 Cosplay video. Know of another great G.I. Joe fan film I should feature? Contact me through Facebook or Twitter and I'll add them. Yo Joe! The Cobra forces have stepped their game up with the Cobra Adder, Battle Barge, BUGG, IMP and Stellar Stiletto! The Joes have responded in kind with the Desert Fox 6 W.D., the Skystorm X-Wing Chopper and the Swampmasher! Head over to the 1988 vehicle overview to see them all! Ever wanted to see all of the G.I. Joe filecards in one place? I'm building a virtual Rolodex! 1982-1985, also know as "the peach years" for the peach file card color, are now complete. Check them out over on The G.I. Joe Rolodex. I'm re-trimming all of the file cards as I go, to clean them up and make the Rolodex look more uniform. I'm also updating these on each character page, so it takes a while. Stay tuned for 1986-1994 updates. I finally laid my hands on a Pile Driver, so head over to T'Gin-Zu's page to check out the new box art! Scroll to the bottom of the 1990 Catalogs page to check out the Micro Figures poster, complete with a slide show of all 20 file cards. I tracked down a MOC v5 Stalker with the horizontal logo, so that has been added to The G.I. Joe Yearbook and the Stalker v5 pages. The Maggot is here, and it is AWESOME. Seriously, I love this Cobra vehicle. I've never owned one and I was blown away by the level of detail in the molds - with joysticks, monitors and mechanics visible everywhere you look. Have a look at the Maggot page, and be sure to scroll down. When you are done with that, check out all of the 1988 vehicle box art and blueprints that were posted this week! This was a BIG vehicle year and a tremendous amount of Photoshop work, so I hope you all enjoy the trip down memory lane! A huge THANK YOU to Page and Greg Wagner, Tim Dz, Chris Cardillo, Crowemag Toys and the Yo Joe Outlet for their contributions!!! Check out Starduster's page, or the 1987 catalogs and offers page, to see the very first 3DJoes slideshow including all three Starduster mini-comics! These obscure collectibles were given away in select boxes of G.I.Joe Action Stars cereal. Note that the comic book is dated 1985, well before Starduster was made available to order in 1987. Nullifier's A.G.P., Skidmark's Desert Fox, Star-Viper's Stellar Stilettto, Hot Seat's Raider, Overlord’s Dictator and Updraft's Retaliator. Live from the JoeCon floor, it's my first video interview! I'm back from JoeCon! There are tons of photos over on the 3DJoes Facebook Page. NBC Just dropped an EPIC tribute to the 1980s G.I. Joe cartoon last night! Don't worry, it's more like the one created by Sunbow, not DIC. The 1988 Tiger Force Vehicles are underway. We've just scratched the surface with the Tiger Fly and Tiger Cat, so stay tuned for more! The Tiger Force vehicles are courtesy of the Yo Joe Outlet. Please visit them on eBay. The Cobra Pogo Ballistic Battle Ball and the Coastal Defender have arrived. Bounce on over to the 1987 Vehicle Overview to see them all! Love G.I. Joe card art? Me too! Now you can browse every carded figure from the ARAH line (1982-1994) by simply scanning the card art! Simply click the carded figure to go to that figure's page and see their 3D photos, card backs and file cards. 1987 catalogs and offers page: "Live the Adventure - Operation Space Station" and four Steel Brigade offers. 1988 catalogs and offers page: "Operation Blackout" catalog, "Top Secret: The Dance of Doom" catalog, "Is This the End of Serpentor?" figure insert, Face Camo figure insert and Super Trooper figure insert. 1990 catalogs and offers page: "The Incredible Shrinking Joes!" catalog. The G.I. Joe Persuader, Road Toad, and S.L.A.M., the Dreadnok Cycle, and the Cobra Buzz Boar, Jet Pack and Sea Ray have all arrived on the 1987 Vehicle Overview page. Also, the rest of the 1987 vehicle pages are up, with box art and blueprints for almost all of them. If you have something that we are missing, and you want to contribute to 3DJoes then please contact us via Facebook or Twitter! There were eight Motorized Action Packs released in 1987, featuring windup motors and an on/off switches. I had several of these as a kid and I remember really enjoying them. From the Earth Borer's spinning chrome tip, to the Helicopter's rotating blades, to the Pom-Pom's recoiling barrels, they added so much fun to play time. Check them all out today over on the 1987 Vehicle overview! The 1982 Cobra Missile Command Headquarters is the only G.I. Joe playset ever made out of cardboard. 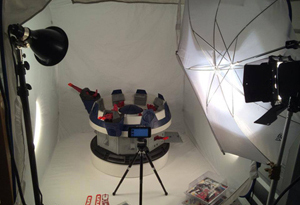 It is also the only playset or vehicle to feature product photography rather than illustration on the front of the box. The MCHQ was only sold at Sears and is quite rare. Due to the materials it is extremely fragile, and finding one in decent condition can be quite a task. This set is one of the "holy grails" of 1980s Joe collecting. To wrap up 1982, I decided to take another pass in Photoshop on all of the file cards and box art photos. I have been steadily improving the photo editing since beginning the site less than two years ago, so the 1982 photos were due for a refresh. Be sure to check out all of the 1982 figure and 1982 vehicle pages to see the improved photos! What would your favorite G.I. Joe and Cobra characters look like in real life? These hand painted Sideshow Collectibles polystone statues are probably the closest we can come as collectors to owning the real thing. They are truly amazing collectibles. 3DJoes has partnered up with Golden Beast, LLC to create an ARAH figure collecting app. JoeFinder features every figure from 1982-1994! The best part? There's a free version! Get all of the details over on the JoeFinder page. G.I. Joe was everywhere in 1984! There were cartoons on TV, toys in stores, and comics on shelves. Check out these 1984 commercials! The Battle Force 2000 vehicles have arrived over on the 1987 vehicle overview! All six of these vehicles are courtesy of our friends at the Yo Joe Outlet. Please visit them on eBay! The six 1987 Battle Force 2000 vehicles combine to form the Future Fortress, "the most indestructible stronghold in the world!” so be sure to scroll down on each vehicle page to check that out. We are still looking for photos of these vehicle boxes, as well as scans of the blueprints. Please contact us on Facebook or Twitter if you'd like to contribute to 3DJoes! Love G.I. Joe card art? Me too! Now you can browse 3DJoes.com simply by scanning the card art! The G.I. Joe Yearbook is a visual index of all of the carded G.I. Joes and Cobras. It currently covers 1982-1992. Bookmark this page and check back often, as I will develop this page to include every carded figure from the ARAH line, from 1982-1994. I've updated the 1985 Killer W.H.A.L.E. box art, courtesy of Page Wagner. I've also added photos of the 1989 H.I.S.S. II and Mud-fighter, the 1990 Hurricane, the 1991 Interrogator Battle Copter, and the 1993 Armor Bot and Detonator. Check them out on the driver pages. My good friend Tim has hooked me up with photos of all six Sky Patrol figures on the card. Check them each out via the 1990 Overview, or scan them all quickly on The G.I. Joe Yearbook. Thanks Tim! The Terror Drome has arrived! This is the first of many large vehicles and playsets to come. My 2' x 2' light box can be seen on the left. My new 4' x 4' light box, motorized 2' lazy Susan (that can support up to 300 lbs), and light kit are on the right. There are lots of large vehicles and playsets are yet to come on 3DJoes.com! The second and final "A Real American Hero" figure poster is here! It features every figure from 1990-1994. That's a whopping 241 figures on one 24"x36" poster! The two 80s and 90s posters side by side show every figure released during the G.I. 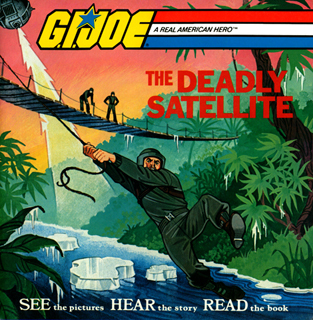 Joe A Real American Hero run (which lasted from 1982-1994). Order yours today and be one of the first to have every single ARAH Joe and Cobra on two beautiful posters! Thanks for supporting 3DJoes! Don't have wall space for a 3DJoes poster, but still want to look at GI Joes every day? 3DJoes desktop wallpaper is here! You can choose from "3DJoes of the 80s" or "Carded 3DJoes" (82-85) over on the Desktop Wallpaper page. Love G.I. Joe card art? Me too! Now you can browse 3DJoes.com simply by scanning the card art! The G.I. Joe Yearbook is a visual index of all of the carded G.I. Joes and Cobras. It currently covers 1982-1989. Bookmark this page and check back often, as I will develop this page to include every carded figure from the ARAH line, from 1982-1994. The 1992 Talking Battle Commanders feature three commands and a fourth electronic battle sound. Check out Cobra Commander, Hawk, Overkill and Stalker's pages to hear their commands! The second and final "A Real American Hero" figure poster is almost here! It features every figure from 1990-1994. That's a whopping 241 figures on one 24"x36" poster! The two 80s and 90s posters side by side show every figure ever released during the G.I. 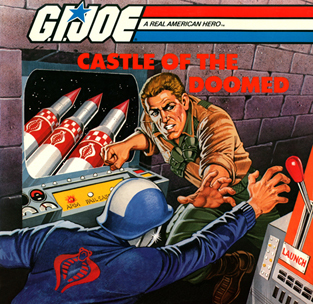 Joe A Real American Hero run (which lasted from 1982-1994). The final design can be seen here. It should be ready to ship in the next week or two, depending on the printer's schedule and any revisions. Stay tuned to this page, or fill out the form at the bottom of this page and I'll email you as soon as you can order! 3DJoes.com was born back on August 24th, 2012. It only took us 16 months to document every figure released from the monumental "G.I. Joe: A Real American Hero" collection. This has been a tremendous journey and we could not have done it without contributions and support from many of you. So, to everyone that helped get the word out, contributed pieces from their collection, donated photos, spent time slaving away at the light box, gave emotional support, and especially those that have bought posters to help offset the costs of maintaining 3DJoes.... THANK YOU! Today we roll out the last of the 1994 figures: the 30th Anniversary figures. These beautiful figures took us back to the basics, and after a few brightly colored years with mostly outlandish concepts it was a much appreciated return to the military roots of G.I. Joe. They first released the Action Marine, Pilot, Sailor, and Soldier individually, and then they later released a boxed set including those four (with some tweaks) and a new Action Pilot Astronaut with a space capsule! What a fun end to the A Real American Hero run, and how appropriate to look back at where G.I. Joe began and pay tribute. Check them out over on the 1994 figure overview! Don't worry, 3DJoes isn't done yet. Next we will document the large 1982-1986 vehicles and then we're moving on to 87-94. Yo Joe! A few days ago I came across the "Worlds Largest Collector of GiJoe ARAH" on twitter. Naturally, I contacted him right away! It turns out he is a die-hard G.I. Joe collector, and he was willing to contribute to 3DJoes. So, check out the much improved photos on these pages: 1982 MMS and Hawk, 1982 MOBAT and Steeler, 1982 9 back Snake Eyes, 1985 U.S.S. Flagg and Keel-Haul, 1986 Night Raven and Strato-Viper, 1988 Hit & Run Target exclusive, 1988 Secto-Viper BUGG, 1988 Armadillo Rolling Thunder, 1990 Decimator Hammerhead, 1992 Air Commandos Spirit. All of these new photos are courtesy of Chris Cardillo. Please check him out on eBay, or give him a shout on twitter. Hasbro released 14 carded Star Brigade figures and two final Star Brigade drivers in 1994. These figures are fun as all get out, if you can check your preconceptions of what G.I. Joe should be at the door. The Star Brigade subset introduced three aliens from the Lunartix Empire: Carcass the alien destroyer, Lobotomaxx the stellar explorer, and Predacon the alien bounty hunter. All three had unique features like bendable arms, a bendable tail and neck, and a four arm torso. They really pushed the limits of toy design with these figures. 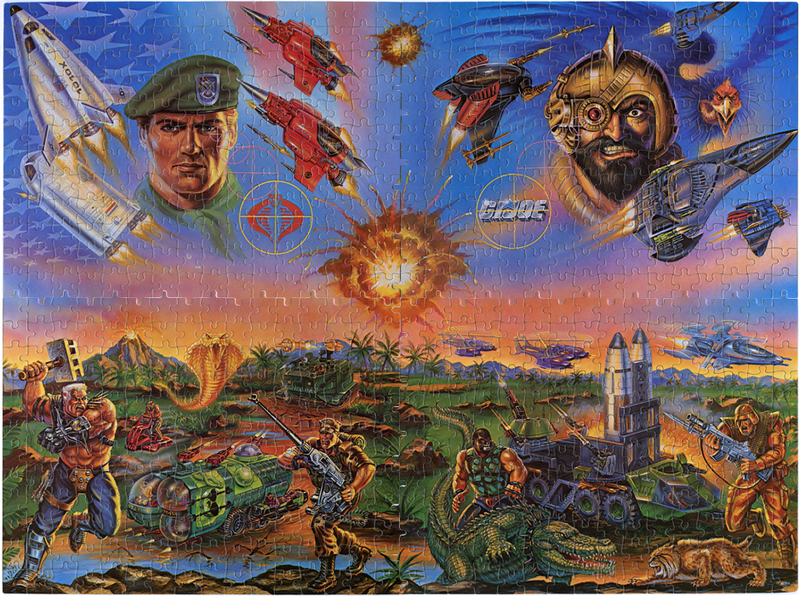 The 1994 Star Brigade introduced several new characters: Cobra Blackstar, Effects, Gears and Space Shot. Many classic figures were given a space-ready redesign, like Cobra Commander, Duke, Roadblock, and Sci-Fi. Several of the 1994 Star Brigade figures came with unique action pack like accessories. Cobra Commander's "Cobra Space Crawler" was a climbing harness attached to a suction cup wheel, which enabled him to travel along the underbelly of smooth surfaces. Fun stuff! Check them all out over on the 1994 figure overview! I'm still missing Dogfight's file card, and these carded figures. Please contact me via facebook or twitter if you have these driver cards / carded figures to lend, scan, photograph, or sell. Hasbro released 14 carded Battle Corps figures and one final Battle Corps driver in 1994. These figures were produced in both China and Indonesia, which resulted in several paint app variants. To compound matters further, Hasbro also changed the card art on some figures from the older horizontal logo (with a red or blue laser backdrop) to a new vertical logo (with a red or blue to black gradient background). There are thirty+ known 1994 Battle Force variants featuring various packaging and paint app combinations. We've been hard at work documenting them all! This was a TON of work, so I hope you have a great time looking back on these. The 1994 Battle Corps introduced only one new Joe, Ice Cream Soldier. Many old Joes were given a redesign, like Dial-Tone, Flint, Lifeline, Shipwreck (a new personal favorite) and Stalker. Several Cobras enjoyed a redesign, including Major Bludd, Metal-Head and the Vipers. All in all, it was another colorful year revisiting many of my old favorites. I still could have done without all of the neon, but hey, it was the 90s, so I can't blame Hasbro entirely. Shadow Ninjas are made of a translucent plastic, and their accessories are also translucent. According to the packaging, they wore color-change body armor that gave them a secret "inviso-power!" All six 1994 Shadow Ninjas featured a spring-action, martial arts move. Head over to the 1994 overview to check them out! The Blockbuster is also one of the largest G.I. Joe vehicles from the 90s. You can cheek out the box art over on 1994 Windchill's page. The 1993 Ninja Force featured a spring-action, martial arts moves. Their vehicles also had spring-action features. The Ninja Raider Battle Ax can now be viewed over on 1993 Red Ninjas' page. The Shark 9000 is one of the coolest G.I. Joe vehicles from the 90s. You can cheek out the box art over on 1993 Cutter's page. Also, the Cobra Power Fighters can now be viewed over on 1994 Techno-Viper's page. Techno-Viper's 3D photo has also been added. The final year of G.I. Joe ARAH is underway. First up: 1994 Joe Con Exclusive Fighter Pilot! This über rare Fighter Pilot box and figure are courtesy of Scott Kruger / Lantern Lad from OG13. Thanks, Scott! I have added MOC photos of the Cobra Air Devil, thanks to Joe of The Toy Palace! I've also updated the product shots for all four 1991 Air Commandos and both 1992 Air Commandos. Thanks, Joe! G.I. Joe was EVERYWHERE in the 80s. I remember waking up early to watch the cartoon before school. After school I'd beg my mom to take me to Toys 'R Us to look at the aisles full of G.I. Joe toys. If I was lucky, she'd stop in Waldenbooks and I could check out the comics too. It was awesome. One vital part of the G.I. Joe marketing machine was television. These commercials were everywhere. They combined the familiar music, songs, and animation of the Sunbow G.I. Joe cartoon with product shots of kids having the time of their lives playing with G.I. Joe toys. These kids were always outdoors on perfect days playing with their friends and the newest of the new G.I. Joe toys. After every commercial I was filled with the urge to beg my mom or grandmother "pleeeeeeeeeeeeeeeeeeease buy me ___!" I was scanning hundreds of vaguely named (and often redundant) G.I. Joe commercials on YouTube the other night and decided there needs to be a better way to walk down memory lane. For now, I'm starting with the 1982 toys and the 1983 toys, complete with commentary. Have a look and let me know your thoughts using the social media links in the top right corner! I have uploaded photos of the über-rare 1994 Joe Con Exclusive Fighter Pilot, courtesy of Scott Kruger aka Lantern Lad from OG13! I have also uploaded 1993 Nitro-Viper's file card, and photos of the 1994 Joe Con magazine that it came in. Finally, the 30th anniversary Action Marine, Pilot, Sailor and Soldier all now include close-ups photos of their original file cards, featuring card art not product shots. 3D photos for 1994 are still to come! 15 of the missing driver file cards have been uploaded, thanks to Captain Chunk of OG13, Spiderpumpkin of YoJoe.com and OG13.com, and Tim Dz! Check out the pages for Ace, Armadillo, Cutter, Decimator, Major Storm, Nullifier, Sci-Fi, Secto-Viper, Star-Viper, Track Viper, Updraft, Vapor, Wild Boar and Windchill v1 and V2 to see their contributions. I have posted carded figure photos, file cards, detail shots and more! All 14 Battle Corps figures, six Shadow Ninjas (now with secret "Inviso-Power!" and still featuring spring-action, martial arts moves), 16 Star Brigade figures (including new wacky "Lunartix Empire" aliens), seven 30th anniversary "Action" figures, the mail order "G.I. Joe" and the very first Joe Con exclusive (the ever elusive Fighter Pilot) are all covered. 1994 was the last year for the "A Real American Hero" line, but they went out with a bang, releasing 45 new figures. Dial-Tone and Dodger's Sonic Fighter pages are now complete with card art and sound effects. Check 'em out! Over the last year, the 3DJoes story has been told in print articles, online features, and podcasts. Our new "3DJoes media coverage" page gathers these resources in one place. The old "News!" section has been more accurately re-named the "3DJoes updates!". The first "Carded 3DJoes" poster is here! It features every single carded figure from 1982-1985. That's 49 unforgettable Joes and Cobras on one 24"x36" poster! Check out the merch page to see how we used bullseye varnish to make the bubbles glossy. It looks awesome! Why make posters? Well, 3DJoes costs around $1,000 a year to run. Most of that pays for the $80/month subscription to the 3D photo technology used throughout the site. The rest goes to registration and hosting. We sell awesome posters to help offset that cost. Please consider picking one up to help keep 3DJoes.com spinning add free! The 1993 Star Brigade consisted of six astronauts, six battle-armored warriors and two drivers. Oddly, there were two versions of Ozone. That's a total of 15 new figures! There was one new character, the half-man, half-machine cyborg known as Robo-JOE! Some old favorites were outfitted with Robotic Battle Armor, including Destro, Duke and Rock 'n Roll. Heavy Duty is the most memorable of the bunch though. Check them all out on the 1993 overview, and be sure not to miss Sci-Fi's hair cut! One year ago today, I hit "publish" on 3DJoes.com, and a web site was born. The last year has been a tremendous amount of work, but I haven't been in it alone. I've had help from many friends, some of them old friends, but most of them new. That has been the biggest reward in this whole endeavor, making so many new friends that share my passion for 30 year old plastic men and women. It has truly been a pleasure meeting and working with all of you. To celebrate the occasion, I am of course rolling out new content. The 1993 mail order figures are all posted! Hasbro released 16 mail order figures in 1993. The Arctic Commandos, Copter Pilots, International Action Force, Deep Six, and General Hawk are all pure re-paints of previously released versions. That said, some of them are improvements over the originals in my mind. Stalker v4 and Budo v2 are personal favorites. The Rapid Deployment Force was an odd re-issue (not re-paint) that re-released three previous figures, stripped them of their original accessories, and gave them three disparate weapons. They also came with a black version of the old Pocket Patrol. 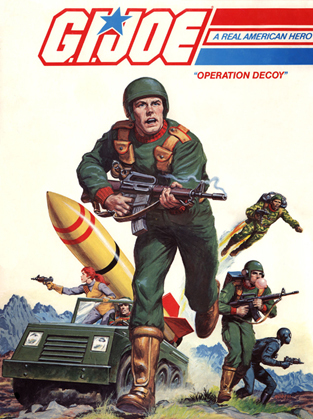 Finally, Cobra got in the Name Your Own figure game with the "Create a Cobra" that, similar to the Steel Brigade concept, was a generic Cobra that collectors got to name and describe. Today, we are also celebrating the launch of Vintage3DJoes.com! This amazing site, hosted by Matthew McKeeby, is starting off with a bang. Matt has already uploaded 140 spins and over 550 photos of '64-69 G.I. Joe goodness! What are you waiting for?! Go check out that site. Finally, to celebrate our first anniversary, we are selling "3DJoes of the 80s" posters for HALF OFF! Posters are only $10 each plus shipping. You can't beat that! This sale will only last two weeks. Prices will go back up to $20 each on 9-8-13, so jump on it! As always, thanks for tuning in! Your support and patronage has made this last year a blast. Be sure to connect with me on Facebook or Twitter, or just hit me up on HissTank or OG13. I'm looking forward to making many more Joe Bros in year two. "The G.I. Joe Yearbook: A Visual Index of Carded Figures" page has been really popular, and several folks have recommended I make a poster of it. So, I started working on the first one tonight, featuring the 1982-1985 single carded figures. I figured this would be a good first group since they all featured the 2D G.I. 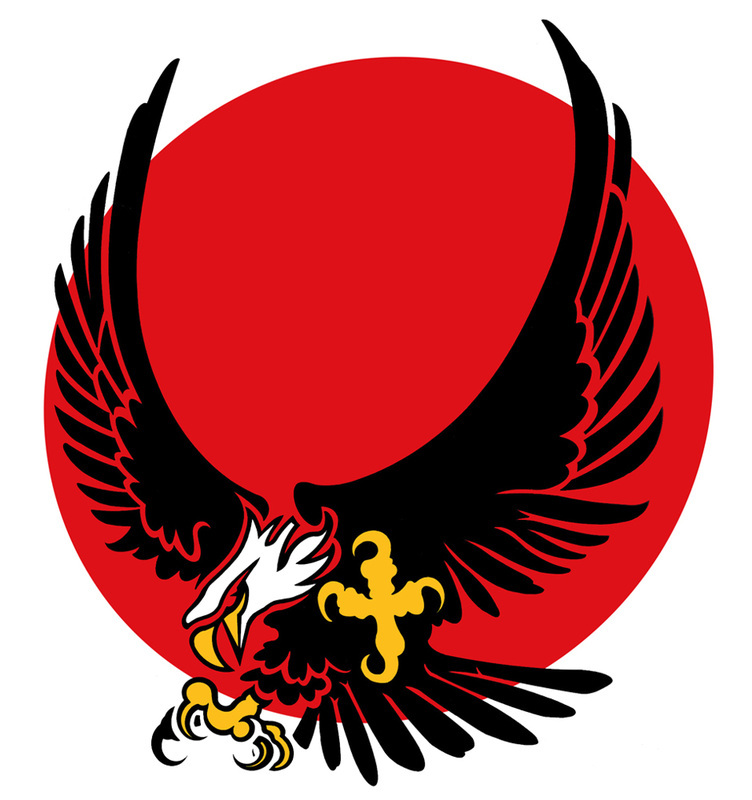 Joe logo. As I started designing the poster I realized they could all fit on one poster (without including the Tomax & Xamot two pack), or they could be split up over two posters (and the twins could be included). I'm torn over which I prefer. My gut is print them all on one poster, but I want to see what the rest of the community thinks before making a decision. Please vote either on HissTank.com, OG13 or JoeCanuck and let me know which option you'd rather buy! The Ninja Force must have sold well in 1992, because Hasbro brought them back in force in 1993. The six 1992 figures were trumped by one and Hasbro upped the ante further with two Ninja Force vehicles and drivers. I for one am happy to see the return of Scarlett and Zartan, two key figures that hadn't seen store shelves since the early 80s. Be sure to scroll to the bottom of each figure's page to see an all out ninja melee! Once again, a big thanks to G.I. John for his help with all of the 1993 3D photos! 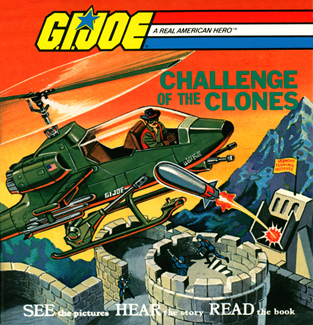 The Mega-Marines featured four Joes and two cobras. Each came with a weapons tree, moldable bio-armor (Play-Doh), an armor mold and a missile launcher. The Mega-Monsters featured two oversized genetically enhanced soldiers, complete with grabbing tentacles, gut bombs and monster smells! I couldn't make this stuff up if I tried. Check out the madness over on the 1993 Overview! Also, you may have noticed something new in the new footer. That's right, 3DJoes is growing up and going back in time. Be sure to check out Vintage3DJoes.com, it will go live in two weeks! Love G.I. Joe card art? Me too! Now you can browse 3DJoes.com simply by scanning the card art! The G.I. Joe Yearbook is a visual index of all of the carded G.I. Joes and Cobras. It currently covers 1982-1985 (the peach file card years). Bookmark this page and check back often, as I will develop this page to include every carded figure from the ARAH line, from 1982-1994. The Dino Hunters are live! Check out Ambush v2 and Low-Light v4 to see this crazy set. It features some of the best box art EVER. It also features one funny looking T-Rex. Also, the Battle Corps Drivers and Pilots are now posted, so check out Ace v3, Cutter v3, and Nitro Viper. As always, if you have any of the file cards or vehicle boxes that I'm missing, then please check out my want lists and contact me to help! What happens when two die-hard G.I. Joe fans are trapped for 16 hours in a rental truck on the way back from Joe Con 2012? They laugh their butts off writing the script for Joes' Anatomy! Over a year later, their sleep deprived vision has come to life. "Joes' Anatomy - part two: the thrilling conclusion!" Written, Produced, and Directed by Carson Mataxis & Joe Goldston. This is a BIG one! Hasbro released far more G.I. Joe figures in 1993 than in any other year of the "A Real American Hero" 13 year run. Not counting the Street Fighter toys (since they were never part of G.I. Joe continuity and will not be covered on this site), there were 91 figures released in 1993! That's more than 1991 and 1992 combined, and more than double 1994. Needless to say, we've been hard at work. Photos of the carded figures and file cards have been posted for all of 1993! This was a TON of work, so I hope you have a great time looking back on these. All but four of the 41 Battle Corps figures are posted, many with multiple 3D photos! 1993 introduced some new Joes, like Colonel Courage, Long Arm, Mace and Snow Storm. We were reintroduced many fan-favorites like Bazooka, Beach-Head, Duke and Outback. On the Cobra side, we met the Crimson Guard Commander, Gristle, Headhunter Stormtroopers and the Night Creeper Leader. We were also reintroduced to Dr. Mindbender and were issued new Alley Vipers and H.E.A.T. Vipers. All in all, it was a colorful year revisiting many of my old favorites. I could have done without all of the bright colors, but hey, it was the 90s, so I can't blame Hasbro entirely. 2 Dino-Hunters, 8 Mega Marines, 9 Ninja Force, 15 Star Brigade, and 16 mail order figures are all coming soon. "Joes' Anatomy - part one: In this episode of Joes' Anatomy, a squad of Joes rush to the infirmary of their secret underground headquarters to save one of their fallen comrades...."
This is my second largest roll-out ever! We are rolling out 3D photos of 6 Drug Elimination Force (D.E.F.) carded figures (each with a unique "electronic battle-flash" weapon), 3 more Eco-Warriors carded figures (with water-squirting weapons and "color-change battle damage"), 6 Ninja Force carded figures (with spring powered "real ninja action"), 4 Talking Battle Commanders carded figures (with giant backpacks that allowed them to "shout out their orders"), 2 more Air Commandos carded figures (with working gliders), 2 more Battle Copters pilots, and the mail order Steel Brigade v2 and Cobra Ninja Vipers. Will Duke master the rocket rodeo? How does General Flagg launch missiles in a blackout? What was the deal with the Roadblock accessory recall? Is Wild Bill balding? Is Headman on meth? Is Deep-Six still a recluse? What color were Cobra Ninja Viper's swords? How many Steel Brigade patch variants are there? Find out the answers to this and more on the 1992 overview page! A big thanks to G.I. John for his help with all of the 1992 3D photos! All 12 carded figures from the main line are posted, many with multiple 3D photos! From Barricade to Wild Bill, they're all there. 1992 introduced some new Joes, like Barricade and General Flagg, and it reintroduced many fan-favorites like Duke, Gung-Ho and Wet Suit. On the Cobra side, we met the Flak-Vipers. We were also reintroduced to Destro, Eels, and Firefly. All in all, it was a strong year revisiting many of my old favorites. D.E.F., Eco-Warriors, Ninja Force, and Talking Battle Commanders are all coming soon! I was building the pages for 1993 this weekend when I realized that something had to change in terms of the yearly navigation. There are simply too many figures to have to scroll through them in one giant column. So, when you roll over the "Figs (1982-94)" navigation, and then roll over a year, you'll now see categories (Carded Figures, Drivers and Pilots, Mail Order, and any sub brands of that year). I think this should make browsing by year much easier to use. I hope you agree! There are a lot of dead links in the A-Z navigation that I will now have to go in and re-link. As always, please let me know if you discover any dead links or missing content. You can reach me via the facebook and twitter links in the top right corner. 3DJoes isn't just about fancy 3D photos! This site is all about the illustration, sculpture, and photography of G.I. Joe: A Real American Hero. Over the years I've collected many catalogs and offers. These print outs came with the various figures and vehicles, and they only made you want more figures and vehicles. Those guys at Hasbro knew exactly what they were doing. I've uploaded 1987-1990. Check them out via the navigation bar at the top of this page. Marvel at the awesome illustration on the 1987 Catalog, meet the Iron Grenadiers in the 1988 Catalog, puzzle at why they used the Crusader illustration on the 1989 Catalog, and then realize that they were ditching the lush illustrations of the past in the 1990 Catalog. If you are hungry for more art when you are done with that, check out the 1992 figure overview. The 3D photos aren't up yet, but the card art and file cards are all live. I just added the last missing 1991 figure, Cloudburst. I also added file cards for all four 1991 Air Commandos. I'm still looking for photos of these carded figures. Drop me a line on Facebook or Twitter if you want to contribute! All 12 regular single carded figures are posted. Hasbro also released 6 Drug Elimination Force (D.E.F.) carded figures (each with a unique "electronic battle-flash" weapon), 3 more Eco-Warriors carded figures (with water-squirting weapons and "color-change battle damage"), 6 Ninja Force carded figures (with spring powered "real ninja action"), 4 Talking Battle Commanders carded figures (with giant backpacks that allowed them to "shout out their orders"), 2 more Air Commandos carded figures (with working gliders), 2 more Battle Copters pilots, and two mail order figures for a total of 37 new figures. I'm still missing a few cards from 1992, seen here. Please contact me via facebook or twitter if you have these driver cards / carded figures to lend, scan, photograph, or sell. Yo Joe! 6 Eco-Warriors (with color-change battle damage and water-shooting weapons), 6 Super Sonic Fighters (with electronic lights and battle sounds), 4 Air Commandos (with gliders that can fly up to 40 feet), 2 Battle Copter pilots (with high altitude one man helicopters), and the mail order Lifeline are all live! Will Road Pig know what to do with an electronic backpack? Who is the first G.I. Joe to wield a boomerang? Can Psyche-Out possibly carry all of that equipment? Find out the answers to this and more on the 1991 overview page! The "Figs A-Z" index (the second button on the top left) has been updated to feature every figure from 1982-1991. Please check it out and let me know if you find any broken links. Contact me via Facebook or Twitter using the links in the top right corner. Thanks for helping troubleshoot 3DJoes! All 17 carded figures from the main line are posted, many with multiple 3D photos! From Big Ben to Tracker, they're all there. I had completely aged out by 1991 (comics had taken over as my top hobby), so many of these figures were brand new to me only five years ago when I resumed collecting ARAH. Now that I've gotten to know them, I have to say that there are some really cool figures here. There are some nice re-makes of old favorites (Dusty, Low-Light, Sci-Fi, and Snow Serpent), and then there are some more questionable re-makes (General Hawk in a jet pack, Snake Eyes in blue and orange, and a very angry Grunt in some tight mustard-colored pants). 1991 introduced some new allies (from the Marvel comic book): Big Ben (the SAS trooper) and Red Star (the Oktober Guard officer). We also were introduced to some new Joes (Heavy Duty and Tracker) and some new Cobras (Desert Scorpion and Crimson Guard Immortal). I had a blast breaking 'em all out and making some new friends. I hope you enjoy them too. Eco-Warriors and Super Sonic Fighters are coming soon. 12 new figures have landed, all with multiple 3D photos! The Sky Patrol figures featured all new head sculpts on some repainted classic drivers and pilots. Check them out and see if you can identify the body. Then scroll down to the group photo for the answer. These figures don't feel like plain old repaints. Their awesome helmets (many with moving visors), cool weapons, and silver parachutes made them an interesting and play-worthy new Joe unit. The Sonic Fighters were pure repaints of their earlier incarnations, but they came with loads of weapons and of course the infamous [gigantic] sonic backpacks. Believe it or not, after 23 years, three of the six backpacks are still functional! Check out the pages for Dial-Tone, Law, and Tunnel Rat to hear the magic of 1990 toy technology. All 17 regular single carded figures are posted. Hasbro also released 6 Eco-Warriors single carded figures (with water-squirting weapons and "color-change battle damage"), 6 Super Sonic Fighters single carded figures (with giant backpacks that made 4 electronic battle sounds), 4 Air Commandos single carded figures (with working gliders), 2 Battle Copters pilots, and one mail order figure for a total of 36 new figures. I'm still missing a few cards from 1991, seen here. Please contact me via facebook or twitter if you have these driver cards / carded figures to lend, scan, photograph, or sell. Yo Joe! All 18 carded figures from the main line and all 6 drivers are posted, many with multiple 3D photos! From Ambush to Undertow, they're all there. I didn't remember how amazing all of the accessories were from this year. I was starting to age out in 1990, so maybe I didn't pay them enough attention back then. I was 11 years old and comics had taken over as my top hobby. Now that I've taken another good look at them, I have to say that 1990 is one of my favorite years. I'd put the 1990 accessories against any other year for the "best of the A Real American Hero" award. From Ambush's tent, to Pathfinder's weed-eater, to Stretcher's sled, to Rock Viper's grappling hook backpack, to Undertow's harpoon and barracuda... these accessories were just plain fun! I had a blast breaking 'em all out again. Sky Patrol and Sonic Fighters are coming soon. Joe Con 2013 was a blast. I shared a booth with Robert Atkins, the fan-favorite G.I. Joe (and Snake Eyes) comic artist. I met hundreds of G.I. Joe fans, about half of whom were already fans of 3DJoes. I sold 100 or so posters on site. Joe and I premiered "Joe's Anatomy" at the film fest to heavy laughter. I made a lot of new friends, and I finally met Larry Hama, the godfather of GI Joe ARAH. Click here to read more and check out tons of photos. Ok, so I'm not on MTV.... but my poster is! I'm so excited. Check out the article here. A big thank you goes out to Larry at Crowmag Toys for supporting 3DJoes and getting the word out to MTV. He was the first dealer to buy posters from me in bulk. I've bought countless Joes from Larry, so check him out if you're looking for carded or loose/complete vintage Joes. After 8.5 years at a Raleigh advertising agency, I've made the jump to Duke University. So, I'm moving from Raleigh to Durham. It's not easy to pack up and move "The G.I. Joe Museum" so please bear with me as I dig out of boxes. Wanna know more about 3DJoes? Check out the latest "What's on Joe Mind" podcast (episode 74) featuring the beautiful voice behind Lady Jaye and yours truly. My interview kicks off around 54 minutes in. We discuss how and why I'm making 3DJoes, the 3DJoes posters ("3DJoes of the 80s" out now, "3DJoes of the 90s" coming this summer), the upcoming 3DJoes coffee table book (coming this winter), and of course the upcoming JoeCon, where I'll be sharing a booth with none other than Robert Atkins. Yo Joe! 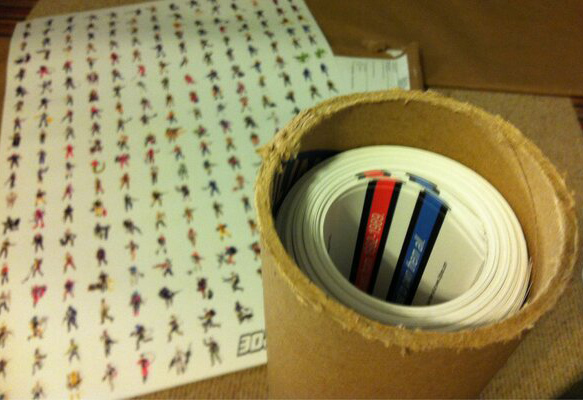 Between moving cities and shipping 90 posters, I've had my hands full. Regardless, I'm back to the 3DJoes grindstone and it feels great! I have to say, Ambush is one of my all time favorite Joes in terms of playability. Check him out hiding under that tent. Also, Bullhorn's backpack with three piece sniper rifle is one of my favorite accessories of the era. I wish I had something positive to say about 'ole Capt. Grid Iron, but a guy with football shaped grenades just doesn't do much for me. If you haven't ordered yours yet, visit the merchandise page to order! If you have a brick and mortar comic/collectibles store and want to order 10 or more for a pretty significant discount, give me a shout on facebook or twitter. I can fit up to 20 posters per tube. If you're overseas, get a few friends together and order together to save on shipping. To see behind the scenes at the printer, check out my "3DJoes of the 80s" album on Facebook. We used a four color printing process, not digital. Four color prints are much higher quality than digital laser prints. The first orders will be shipping this week, and anyone who ordered more than two weeks ago will be receiving a bonus poster! All 18 regular single carded figures are posted. Hasbro also released 6 Sonic Fighters single carded figures (with giant backpacks that made 4 electronic battle sounds) and 6 Sky Patrol single carded figures (with working silver parachutes). There were 6 new drivers as well, for a total of 36 new figures. I'm still missing a few cards from 1990, seen here. Please contact me via facebook or twitter if you have these driver cards / carded figures to lend, scan, photograph, or sell. Yo Joe! Carded Night Force figures are some of the hardest to find and most valuable of the late 80s Joes. My friend Matthew graciously shared photos of his carded Night Force figure collection. Check him out on eBay! He's been on there forever and has 100% feedback. Also, if you want to contribute to 3DJoes, please check out my want lists for 1988-1990 File cards needed and figures needed from 1990-1994. Contact me via facebook or twitter if you have any of these! The first 3DJoes poster is here. It features every figure from 1982-1989. That's a whopping 244 figures on one 24"x36" poster! Check out the merchandise page to order yours today. Please tell your friends about 3DJoes and these great posters. Thanks for helping me keep 3DJoes spinning ad free! Thanks to my buddy Joe at The Toy Palace for letting me borrow his Python Patrol, Slaughter's Marauders, and Tiger Force carded figures. Slaughter's Marauders Spirit and Footloose, Python Patrol Copperhead, Crimson Guard, Tele-Viper, Trooper, and Viper, and Tiger Force Dusty, Lifeline, Roadblock, and Tripwire have all been updated. Oh, and a sealed Rampage. Check em out! This is my largest roll-out ever! 1989 saw the release of 17 single carded figures in the core line. We got new versions of some classic Joes (Deep Six, Rock 'n Roll, Snake Eyes, Stalker) and six new G.I. Joe recruits. The Cobras expanded their Viper ranks to include Alley, Frag, H.E.A.T., and Night Vipers. The Iron Grenadiers took to the skies (with T.A.R.G.A.T. and Annihilators) and the Dreadnoks hired an obnoxious poacher. The re-paints kept coming with the second wave of Night Force two-packs, which produced some of the most sought after ARAH figures of all time. Cobra experimented with radar resistant clothing and formed the Python Patrol. Sgt. Slaughter formed a new land offensive team of seasoned Joes known as Slaughter's Marauders. All three subsets featured six re-paints each, for a total of 18 new carded figures. Throw in nine more drivers and a mail away figure and you've got 45 new figures total. 1989 was a very good year for us G.I. Joe fans! Check out the new merchandise page to see preview images of the first poster! Who wasn't happy when ten early-80s Joes were re-released in new tiger-stripe gear? I know I was stoked. For us fans that started collecting in the mid-80's (myself in '86), this was our first chance to own classic figures like Duke, Recondo, Flint, and Dusty. The Tiger Force featured seven carded figures and three drivers. Eight of the ten figures were pure repaints, and two figures (Skystriker and Duke) were a combination of parts from previous figures. All 17 single carded figures and 12 drivers are posted, many with multiple 3D photos! From Astro-Viper to Voltar, they're all there. 1988 was one of my favorite years, with classic Joes like Hit & Run and Shockwave, and some truly scary Cobras like Hydro-Viper and Road Pig. Night Force and Tiger force are coming soon. I was honored to participate in a survey to determine the Top 50 Cobras of all time, as well as the Top 50 Joes of all time. 22 vehicles, battle stations, and accessories are posted. Each vehicle has 3D driver photos, file cards, blue prints, box art photos, and more. The X-30, Night Raven, Terror Drome, and Tomahawk do not yet have 3D photos. I am going to have to purchase a MUCH larger photo soft box to make those! 25 vehicles, battle stations, battlefield accessories, and accessories are posted. Each vehicle has 3D driver photos, file cards, blue prints, box art photos, and more. The Moray, Battle Platform, and Flagg do not yet have 3D photos. I am going to have to purchase a MUCH larger photo soft box to make those! I've decided to take the plunge and take this site all the way through the ENTIRE A Real American Hero run. I am in the process of filling the holes in my 1988-1990 figure collection. As soon as I finish the 1986 vehicles, I'll be moving into the 1988-1990 figures. Yo Joe!!! 3DJoes isn't just about fancy 3D photos! This site is all about the illustration, sculpture, and photography of G.I. Joe: A Real American Hero. Over the years I've collected many catalogs and offers. These print outs came with the various figures and vehicles, and they only made you want more figures and vehicles. Those guys at Hasbro knew exactly what they were doing. I've uploaded 1982-1986. Check them out via the navigation bar at the top of this page. Marvel at the burlap sack backdrops of the 1982 Catalog, the awesome illustration on the 1983 Catalog, meet Zartan in the 1984 Catalog, be sure to check out the epic illustration on the 1985 Catalog and the Missions Catalog, and the full-color illustrations of the 1986 Catalog, the 10 Original Figures Offer, and the S.T.R.I.K.E. Catalog. If you are hungry for more art when you are done with that, check out the 1985 vehicle pages. The 3D photos aren't up yet, but the box art, drivers, and blue prints are all live. 20 vehicles, battle stations, defense units, and accessories are posted. Each vehicle has 3D driver photos, file cards, blue prints, box art photos, and more. The Rattler and W.H.A.L.E. do not yet have 3D photos. I am going to have to purchase a larger photo soft box to make those. I had every intention of finishing the 1984 vehicles this weekend, but then the Baroness arrived and the rest is history. Enjoy! My friends at Flag Points invited me to talk about 3DJoes (mostly why + how), Sideshow Collectibles' amazing 1/6 scale G.I. Joe line, tips on collecting MOC and AFA 80s Joes, and my earliest memories of G.I. Joe. Have a listen! I use a wonderful application called Arqball Spin (on iOS and Android devices) to make my interactive 3D Joe photos. The creators of Spin are big fans of 3DJoes.com, and they just featured 3DJoes.com as their inaugural Featured Arqballer! Check out the article here. 18 vehicles, play-sets, and accessories are posted. Each vehicle has 3D driver photos, file cards, blue prints, box art photos, and more. The five largest vehicles and playsets do not yet have 3D photos. I am going to have to purchase a larger photo soft box to make those. All 41 figures from 1987 are now posted, many with multiple 3D photos. Be sure to check out the team photos for BF 2000, Renegades, and Cobra-La. I'm still missing some vehicle boxes for the 1987 drivers, so contact me (links above) to contribute your vehicle box art! All 17 single carded figures and five drivers are posted, many with multiple 3D photos! Don't stare too long at Crystal Ball though. There's no telling what he'll make you do. That guy is creepy. 15 new figures are posted, many with multiple 3D photos! 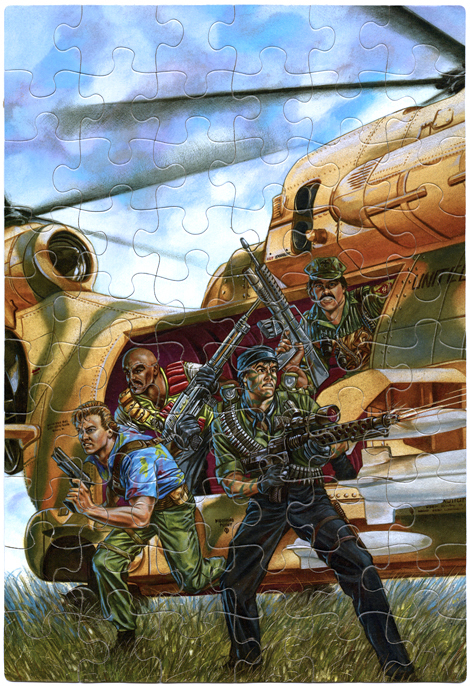 Be sure to check out the custom card art for The Fridge and the five Special Mission: Brazil figures. We decided to re-shoot the 1982 vehicles with the figures that came with them. We also added the figures that were featured on the box art but weren't sold with them (Breaker on the RAM, Rock 'n Roll on the FLAK). These vehicles just look better with the Joes manning the controls. Thanks again to Joe from the Toy Palace for sacrificing his Sunday for the good of Joe fans around the world! All 17 carded figures are posted, many with multiple 3D photos! Be sure to check out the B.A.T. attack for some hand-to-claw combat! A big thanks goes out to Joe from the Toy Palace for giving up two Sundays in a row to help me photograph my Joes! Check out Joe's Joes at the Toy Palace. He's a good honest seller and a good friend. And, he's got tons of Joes! 28 figures in all! This was a BIG year for G.I. Joe. Personally, I think 1985 was the pinnacle of G.I. Joe design. The Twins, Tomax & Xamot had the best packaging design of the entire line. Snake Eyes and Timber had the coolest card art of the entire line, and Snow Serpent has the best sculpt of the entire line. This year is just amazing. 1985 was the year I fell in love with G.I. Joe for life. Relive them now in 3D! So many great 1984 Cobras (Baroness, Firefly, Storm Shadow, Zartan) and Joes (Duke, Ripcord, Roadblock, and Spirit). Who's your favorite? Tweet @3DJoes on twitter to jump in the conversation! I loved the old overview pages for each year. Unfortunately, loading thirty-two 3D photos at once was just too much for some computers/browsers. So, I have made the overview pages for each year much less processor intensive. To do this, I simply told the photos to NOT automatically load. Now, whenever you visit an overview page, you'll see thumbnails of each vehicle or figure for that year with a play symbol. Simply click on a 3D photo to load it, or click on the name button below the photo to go to that figure or vehicles's page. There you'll see a much larger 3D photo as well as card art, vehicle boxes, blueprints, and all sorts of other Joe art. "Here's a link to a site that I'm finding rather useful. Very smooth 3-D action and user-friendly- But what I don't understand is why all the various sites group the figures by model year, but do not provide an alphabetized index. http://www.3djoes.com/1982-overview.html"
I immediately built the "Figures (Alphabetical)" navigation you now see above. Thanks to Larry for the kind post, and the feedback! I just put the finishing touches on the 1983 figures. Check 'em out! I decided to group all of the v1.5 figures together, because we've already seen their card art and file card on their 1982 pages. Yep, we're on twitter. Please follow @3DJoes for updates! I'll tweet as we add new content to the site. WOW, what a response! Thanks to generalsjoes.com and joebattlelines.com (they drove a lot of traffic here by reporting on 3DJoes). There was additional coverage on blogs from Italy to South Korea. I never anticipated such a hearty welcoming from the Joe community. It really makes all of the hard work and investment worthwhile. After about 72 straight hours of photography and programming, the site has its first round of content. I dropped a couple hundred bucks on the domain and hosting for the next 10 years. Translation: 3DJoes is here to stay!